I got a good deal during the week on an Acer Aspire One. I picked up an 8GB SSD, 512MB Lnux version for 140euro. I had no particular reason for purchasing other than I fancied one and the price was right. I figured I would install Windows 7 on it, but after reading up on the hassle involved on installing W7 on an 8GB SSD, I quickly discounted that idea. I thought about putting XP on it, but in the end, I went with the latest version of Ubuntu Notebook Remix. It installed relatively easily from a USB drive. Almost everything worked straight from the install. The only issue was when I installed Skype and found that the microphone did not work. I eventually found a walkthough on how to solve that problem and now everything is fine. 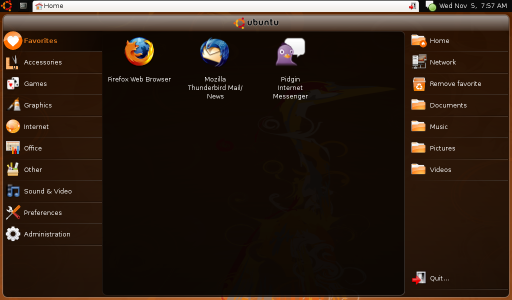 Ubuntu NBR comes with Open Office as part of the install, so that was one of my main packages looked after. I also needed a cad package, but as most cad users out there know, linux is not best served in that dept. On a whim, I installed Wine and then downloaded ProgeCAD 2008 Smart. Much to my surprise, it isntalled without issue and most surprisingly for me, worked first time! It does throw up this error though which I believe will stop ProgeCAD working after the trial period as it cannot be registered. I will have to see what I can do about that. The final mod (so far), has been to totally dismantle the netbook to install an extra 512mb (kindly donated by a friend) to bring total installed ram to 1GB. Now normally if you want to upgrade the memory on a laptop, you undo a couple of screws, remove the panel and install the ram.... Well not so on the Acer Aspire One!!! You gotta take the whole thing apart to get at the spare slot! It truly is not for the faint of heart! I used this tutorial at crunchgear.com to guide me. So, at the moment, all is good with the netbook and hopefully it will stay that way!